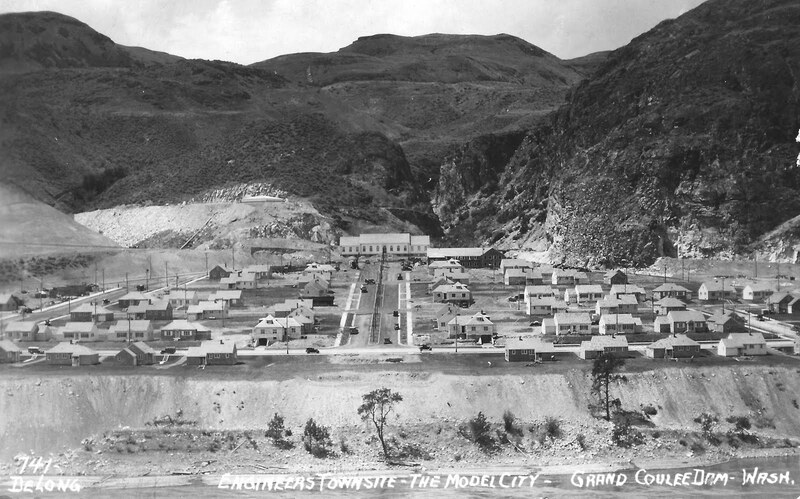 Bureau of Reclamation announced the awarding of two contracts for work at Grand Coulee Dam involving aerial photography and improvement of the rail yards at Coulee City. Jay Whiteford Co. of Seattle submitted a bid of $80,827.50 for aerial survey maps, which will be produced in black and white and color, to assist engineers with sectional data for excavation processes at the site of the third powerplant here. The job at the railhead in Coulee City, Wash., at Odair Yards will involve the laying of 3,100 feet of track, ballasts and crossing. Lampson Railroad Co. of Kennewick, Wash. awarded the contract on a bid of about $30,000. The total amount of contracts awarded for preliminary work to the construction of the third powerplant amounts to more than $30 million. From the "Grant County Journal," Ephrata, WA. Day or night...or early morning, the Ephrata Volunteer fireman are quick to respond to an emergency. 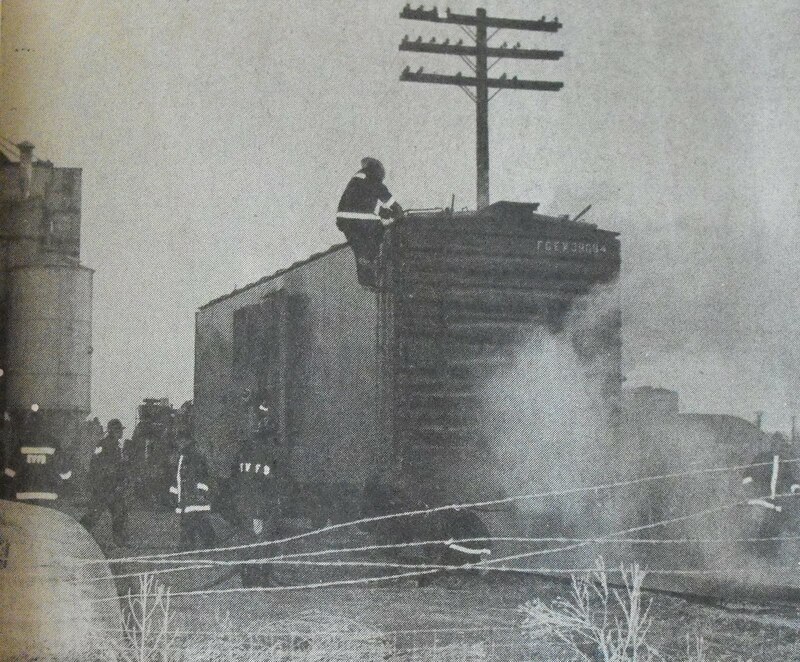 At 6:20 a.m. Tuesday they were called to put out a stubborn fire in a Great Northern boxcar (I know, the picture is a Fruit Groweres Express reefer). The burning car, which was empty, was pushed off on the railroad siding in south Ephrata behind Equipco and Columbia Concrete, where the fireman did their duty. The fire appeared to have started from a hot journal box under the front end of the boxcar and then burned its way up through the bottom of the car. I'll let the article speak for the subject. From the "Ellensburg Daily Record." 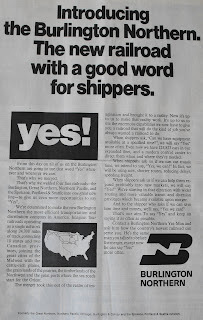 John A. Gellatly, former lieutenant governor of the state and once a candidate for governor is writing a series of articles in his hometown newspaper, the "Wenatchee World," regarding the important news of another era. Recently he had an article on the "Wenatchee Southern Railroad" that a group of Wenatchee apple growers promoted back in 1922. There was not sufficient fruit storage facilities in Wenatchee at the time and the Great Northern railroad, following the first world war could not finance or build sufficient refrigerator cars to handle the apple crop of North Central Washington. So the apple men raised large sums of money to finance the proposed Wenatchee Southern down the west bank of the Columbia river from Wenatchee to Beverly where it was proposed to have a connection with the Milwaukee road and later to continue it south to Kennewick for a connection with the Northern Pacific and Union Pacific. Many tracts of land were purchased for the right of way, engineering parties studied possible routes through Kittitas County and then the group applied for a hearing before the Interstate Commerce Commission. Ellensburg had visions of a direct rail connection between Wenatchee and Ellensburg, via Beverly. It was big news in those days, but the whole picture disappeared in a cloud of smoke when the Interstate Commerce Commission following a hearing at Tacoma in September 1922, decided there was not sufficient justification for the railroad, and that the need could best be solved by acquiring more refrigerator cars and the construction of cold storage warehouses in Chelan County. Long before the visioned Wenatchee Southern, Ellensburg and Wenatchee had sought transportation facilities between the two places. This was even before the Great Northern was built in 1893. There was a stage and trucking line, horse and mule drawn of course, over Colockum Pass for many years, giving Wenatchee the only direct transportation service with the outside world. Also in the early days there was a joint stage line-steamer service between Wenatchee and Ellensburg. The stages and wagons went out over the trails from here to the Columbia river and then loaded their produce onto a regularly scheduled steamer service, that went up the Columbia to Wenatchee and the Okanogan. The flagship of that fleet was "The City of Ellensburg." A public information meeting on the plans of the Beverly-Royal Slope Port District to acquire the Milwaukee Road rail line from Vantage to Othello is scheduled for 7 pm Monday at the Royal Middle School. Discussion of the $750,000 bond issue from the port district on Tuesday's ballot, and recent events in negotiations with the Milwaukee Road will be presented. Its lonely along the Milwaukee Railroad tracks in this Columbia River community southwest of Moses Lake, and Haynes Gearhart fears it could get much lonelier if the few trains that now pass through stop running. Gearhart, a Wahluke Slope farmer who operates a $600,000 grain elevator, fears being out in the hinterlands could mean he'll be overlooked in plans to split up the bankrupt Milwaukee Road's lines. This part of the Columbia Basin needs rail service as much as the Othello-Moses Lake area, he said. "I feel like the guy on a limb with someone working at sawing you off," he said. His grain elevator is on a short spur adjacent to the mainline Milwaukee track just before it crosses the Columbia a few miles downstream from Vantage. Only two trains a day pass through Beverly, one going east, the other west. The Milwaukee Road suspended service last Saturday on nearly half its 9,500-mile system. Planned layoffs of employees in the affected areas have been delayed until cleanup operations have been completed. Meanwhile, workers have been awaiting a federal court ruling on possible New Milwaukee Lines takeover of the western track. A favorable ruling could allow about 5,000 workers in the West to keep their jobs. 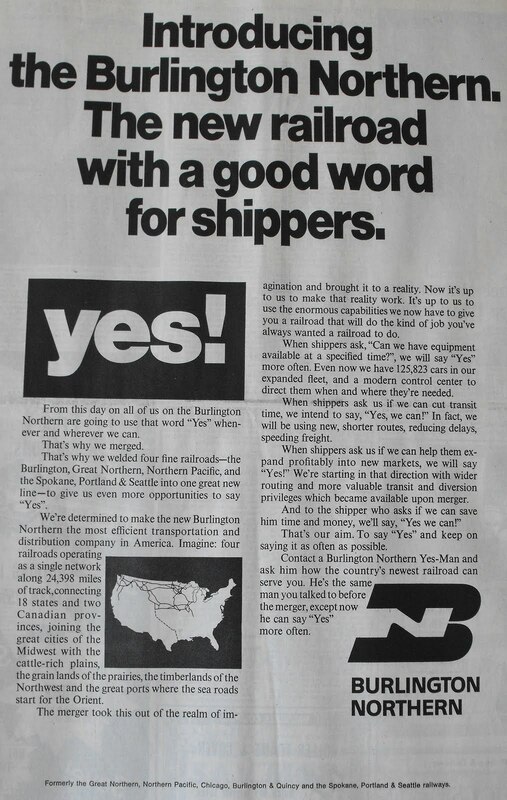 Gearhart says he doesn't think New Milwaukee's chances are too good, so he's trying to convince the Burlington Northern that any plans to take over part of the Columbia Basin operations should involve Beverly, despite the 38-mile haul from Othello. "I think Royal City is in the same boat as we are and also should be considered," Gearhart said. He said Beverly and Royal City will grow because of increased farm development, especially on the Wahluke Slope. Burlington Northern years ago competed with Milwaukee to bring rail service to the sloe but never got any farther than Basin City. "They are never going to build that line now and taking over the Milwaukee would be the best way to serve the slope, which is starting to move now," Gearhart said. His firm, which ships wheat, corn and barley, averages 30 cars a month with more than 300 cars in 1979. "In two years that total could double," he said. Royal City also ships about 300 cars annually. Gearhart sees the potential growth from either a potato packing shed or a fruit shed. The Washington State Department of Transportation agrees with Gearhart on keeping rail service and has designated the Columbia Basin railroad lines essential. That qualifies the Milwaukee tracks for federal assistance. Mr. H. Kirkendall, the well-known railroad contractor, came down from Helena yesterday and will leave for Coulee City in a day or two. As announced in The Review several days ago, he has secured a contract for a section of 25 miles on the line of the Great Northern railroad along the Columbia River below Wenatchee. Talking to a Review reporter at the Hotel Spokane last night he said: "All my outfit except the stock is now at Coulee City, and the horses will be shipped in a day or two. Several sub-contractors have gone out already to look the work over, and T.B. Kirdendall & Co. will take part of it. "The freighting for the camps will all be done from Coulee City and Ellensburgh, the latter town being a little the nearer to the work, though as the road is not so good probably most of it will be done from Coulee City. We expect to commence work very soon, and I think we will be ready for laborers in 10 days at the outside. the whole job will be finished up by the 20th of July." About 500 tons of steel arrives daily in the busy Electric City railroad yards. The steel is for Bethlehem Steel company's concrete trestle, for the Western Pipe and Steel company penstock linings, for closure gates, and other construction. Additional spurs have been built in the yards to facilitate handling of material, a departmental improvement for faster service during concrete-pouring time. A spur has been built to the bending plant and another to the steel fabricating plant. Clearance of the government railroad from the yards to the dam site was measured Wednesday by CBI to determine if the big penstock linings can be brought to the installation point over the line. Several areas of impaired clearance were found. The line may be shifted in several places to meet the condition. If it is found impossible to use the road, a huge trailer will bring the linings to the dam site. Under its contract, CBI must take delivery at the mill. The Northern Pacific officials have decided to put a through passenger train to Coulee City. Up to this time they have been running a mixed train on the Washington Central, but now are putting on a regular, all coach passenger. The date this new train will go on has not yet been set. It was recently decided to put such a train on as far as Wilbur, but now the railroad officials have decided to run it through to the end of the line. Happening on June 10th at 7pm. Location is the Moses Lake Museum and Art Center, at 228 West Third Ave. I'll bring pictures, maps, and drawings that have yet to be seen here at this site, plus this will be a great time to ask questions and heckle me! Here is the website for the museum. While two engines on the Great Northern were bucking snow ran into a large drift, nine miles ease of Coulee City, wish such force as to cause the back engine to rear upon the tank of the front engine. The fireman on the rear engine was pinned fast between the coal and boiler injuring and burning him severely before he could be released from his perilous position. The conductor, Minehan, was so badly frightened that he jumped out of the caboose window, and the last seen of him he was making tracks as fast as he could across the prairie. The engines were running at the rate of 60 miles an hour when the accident occurred. Note: Why Great Northern engines were on the CW, or the name of the town being in error is not know. The Big Bend Empire says that it learns that the Northern Pacific is to be extended from Coulee City to the Columbia River. That already the NP realizes that the trade is being diverted from their road to Coulee City by the Great Northern. The tunnel that was built for use in the construction of Grand Coulee Dam was not used to the potential it was intended for, due to a trestle below crossing the Columbia River that was too light. Instead, it became part of a tail track for a switchback. In the photo, you can see the grade sloping behind the building in the center back. The tunnel goes through the bluff on the right. Another view of the tunnel can be seen here. Photo brought to you by JA Phillips III.